These cigars are unbelievably smooth and reasonably priced. These White Cat Cigarillos are fantastic for the every day desired smoke even better than some of the high priced "gourmet" cigars. With White Cat Black's premium tobacco, the return order rate for the brand is very expected. We are happy to provide all our smokers with the brands that best fit their smoking desires. For the inexpensive price the quality is unexpected. 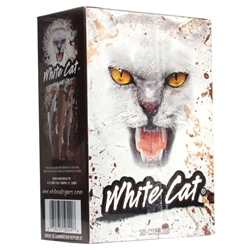 Based on customer review, White Cat Cigarillos are a very pleasing smoke.